With Salesforce1, if you're a Salesforce developer, you're now also a mobile developer. To help you on your journey of Salesforce1 development, check out the Salesforce1 App Developer Guide, now available online. With Salesforce1, if you’re a Salesforce developer, you’re now also a mobile developer. 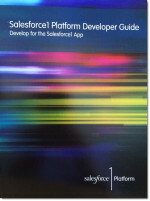 To help you on your journey of Salesforce1 development, check out the Salesforce1 Mobile App Developer Guide (HTML | PDF). This is the book that I worked on along with many other talented folks here at Salesforce. The great thing about this book, if I do say so myself, is that it’s all task based. You learn all about Salesforce1 development by doing. Of course, there’s lots of conceptual information in there, if you’re interested. Whether you use the declarative tools, code, or a combination of both, this will get you started with Salesforce1 development. As you may have read in a previous post, there was a full library of developer books and other materials available at Dreamforce. If you weren’t able to make it to the conference, don’t worry, they’re all available online here. If you’re a Salesforce developer, be sure to check out this book and start taking your users into the mobile world!